Beauty vlogger IAmAmbrosiaa has been spotted on social media with a head full of gorgeous natural hair and the perfect Spring/Summer accessory: A Turban. This old-school remedy to a bad hair day is no new trend. A fresh spin on the look with fun prints to pair with something modern or even bold colors to bring a pop to your wardrobe. The collection of head wraps is the perfect accessory for the naturalista, tying in the benefits of style and function. Head wraps have been spotted on brown girls all over but they're trending even more now to bring a seventies era back to life. Even June Ambrose rocks hers at showrooms for just the right touch of Boho meets Chic. Depending on your mood or attire, finding an appropriate head wrap to mesh with your wardrobe is an easy feat. Keep this in mind while browsing: go bold with a muted look and stay simple with pops of color. The great thing about this hair accessory is that it can be worn multiple ways throughout the week without becoming a dull "do". Also, the wrap can be beneficial by protecting your hair from the elements of humidity, while on vacay or even through June gloom and possible showers. Every woman on the go needs to keep one in her bag, even if it's just to go from day to night. There are four standard ways to tie a turban which the beauty guru offers up in a short video. However, there are always more ways to skin a cat. 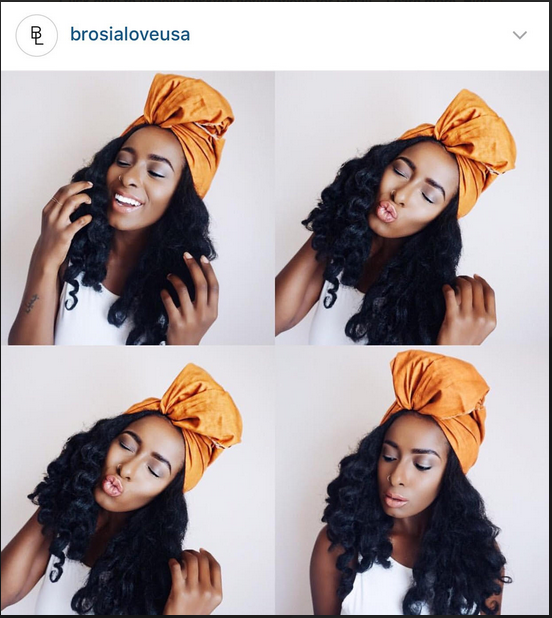 So, tag us on Instagram in your favorite head wrap tying method and share the wealth of style! Xuxa Day is the creator of IATEKATEMOSS. The twenty-something writer has had an extensive first-hand experience when it comes to reputable fashion brands from being a stylist assistant to the beauty world ranging from Clinique, Marc Jacobs to Dior. Xuxa is building a name for herself with her authentic writing style and knack for editing. IATEKATEMOSS is a creative outlet and brand to embellish on the muses of the fashion industry. Whether it be who is gracing a cover or what street style needs be paid homage, IATEKATEMOSS has covered all the bases. Giving insight expands the opportunity of conversations to be had as well as peaking the interest of an audience. The main objective is to give the scoop on when YOU, the reader, fell in love with fashion and why. We all have our stories. Keep reading to follow the journey of a Magnolia bred blogger giving you her spin on fashion and sharing the muse stories she stumbles upon on the way. You can read more of Xuxa Day's conversations about Fashion on her website @https://iatekatemoss.wordpress.com.